Daniela Iezzi defines herself through her choices. This young Italian started playing music in the streets of Berlin, and later started travelling throughout Europe to spread the love. 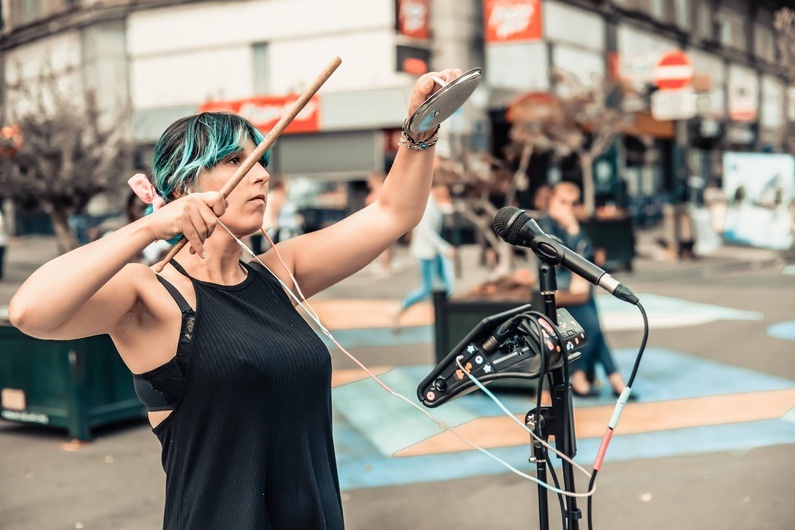 Playing music in the streets taught her how to cope with heartbreak and allowed her to heal emotionally. Not thanks to the act itself, but thanks to the people she met. Cafébabel: How long have you been busking? Daniela Iezzi: I started three years ago when I was 36, in Berlin. A year before I moved, I had come out of an unhealthy relationship that lasted for eight years. Until that point I had been living what you could call a ‘normal’ life, for a musician at least. I had been teaching in different music schools for 14 years and I was also singing in bands. I was supposed to go to Berlin with a friend for two weeks, but she found a job in London, so I decided to go alone. I took my backpack and slept in a hostel for the first time in my life. Cafébabel: What inspired you to start busking? Daniela Iezzi: In Berlin, it was amazing to see so many musicians playing in the streets. Luckily enough I met Riccardo Moretti, a famous Italian busker, and I was positively shocked to see everyone listening to him, buying his music. He told me how his life had changed in the last 15-20 years since he started playing in the streets. That’s when I thought: “I want to have this life. 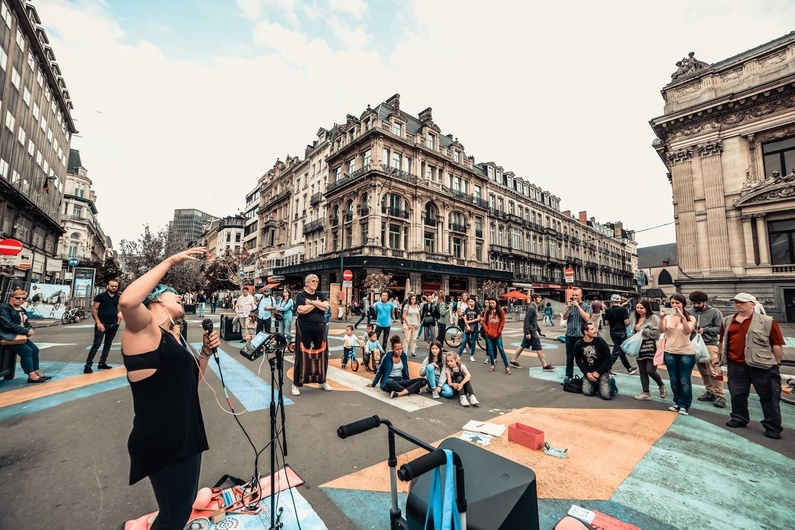 I want to travel the world and be free, have the possibility to meet people who can help me evolve.” Riccardo told me: “If you have a musical project, [busking] is the easiest way to spread it. Buy a car battery, an inverter and a speaker and go!” So I went back to Rome and bought everything, along with a loop station. I decided to go to back to Berlin the following year to try busking. When I went back (for three months) things were hard, but I didn’t give up. I didn’t speak English, so I had to learn how to express myself and learn the language. Cafébabel: What is your musical project Meccanismi about? Daniela Iezzi: Meccanismi is full of personal feelings and has changed a lot throughout the years. With the help of a sound engineer, Andrea Mazzucco, we recorded and mixed 10 songs in a period of two and a half years. All of this in my little 14 square-metre flat in Rome. I decided to do my own original music because I felt I needed to be courageous and express my weakness, my fragility, without fears. I needed to go naked – figuratively speaking! The album was an emotional outlet for me, but also for others. We are all human beings with similar psychological mechanisms. It’s no secret, but it’s better if we communicate with other people; if we ask for help if we feel we need it. I decided to write ten songs about my [psychological] mechanisms. Cafébabel: How did the project start and evolve? Daniela Iezzi: I created the first version in 2011 after a long period of therapy, and having a long-lasting career as a singer and teacher. The first album was recorded with my keyboards, guitar and other small instruments. At first my project got stuck, but when I met Riccardo in Berlin it hit me that busking was the way to be independent and spread my music. That’s how Meccanismi changed completely. I re-arranged eight songs only with the loop station and started busking around Berlin. People were attracted to my music and I felt that it was possible to go big, but I knew that I had to work for it step by step. After singing in the streets of Berlin for five months last year, I decided to move around Europe. Cafébabel: What are some of the most remarkable moments in your travels? Daniela Iezzi: When you travel, you see different situations, people with problems, different thoughts and you can learn a lot from each person and each situation. I had particularly beautiful experiences in Cologne because as a street musician you can be more focused. The police don’t interfere, they simply explain the rules: you can play every day but you just need to stop every 30 minutes and change your location. In Berlin you are at risk because there are no clear rules about busking. I had another beautiful experience in Ljubljana where a man offered my boyfriend and I to stay in his house in the city centre for five days [NB. Daniela and her boyfriend Jonathan are travelling together]. And for free! And it was all because he listened to my music and asked me about my project. When I explained the psychological aspect, he was really touched. I have come to the conclusion that people sometimes offer you good things because they feel some kind of connection; they feel that you are honest in your way of living. Cafébabel: What advice would you give to someone who wants to start busking/performing in the streets? Daniela Iezzi: I would say go and do it! You will discover a lot of things; you start to understand yourself and the people around you differently. It’s the only way nowadays to reconsider your life. Sometimes you may think that your life is horrible, but you don’t usually see what’s happening outside. I have met people with really big problems, but also with big strengths, and I think of them every day because they taught me something. This is the best part of the job. Anthropologically speaking, it’s an interesting experience. Cafébabel: What are your dreams for the future? Daniela Iezzi: I am already doing something that I want to do; I have already realised my dreams. Four years ago, I could never imagine becoming the kind of woman who travels around with her 50 kg trolley. I was in a completely different mood, I was teaching in a music school and I had a normal life. So you could say that I have already realised my dream of travelling the world. The idea is to continue my project. I want to buy another machine and work even harder on the sound so that it reflects what I have in my mind. In winter, I want to work on new songs and expand my project. I would also like to have the possibility of finding a producer who could help me spread my music around the world.